Prince Michel is a big-time operation, and a relative graybeard in Virginia at more than 30 years old. More wines than you can shake a stick at, and busy tasting room; the massive oval bar is a convivial spot to chat with others who are exploring wine country. A gift shop is seamlessly integrated into Prince Michel's winery, so that it seems part of the decor. Everything from wine racks to t-shirts to ceramic leopards to plush robes are on offer. Several large outdoor patios are set up for those who want to stay awhile. And the wines? Something for everyone. Rick was partial to the reds, and I favored the tropical Mt. Juliet Petit Manseng. Self-guided tours are free, and VIP Tours and Tastings are available with a reservation. Prince Michel wines are also available seasonally at the scenic Prince Michel Wine Shop at Carter Mountain, along-side the Carter Mountain Bakery and Country Store. 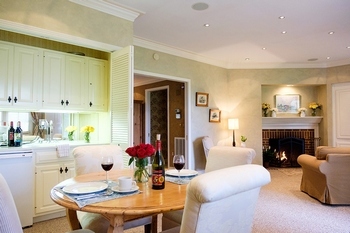 For vineyard lodging, Prince Michel offers one of the nicest options in the state. The four Prince Michel Guest Suites are one bedroom suites decorated in French provincial style, each with a large bath, romantic fireplace, small kitchen, and private patio with views of the vineyard and mountains. Lunch is available on Saturdays, including soups, sandwiches and some very creative paninis.